It's going to be a toasty-roasty week around here, so I may be surviving solely on orange juice popsicles and lamenting the fact that, for some odd reason, I have not owned shorts for the past few years. Happy Monday, all! Can I recommend jcrew factoryor shorts? I live in the 5inch chinos and have had to buy new pairs for YEARS. Ahhh, so many typos! *factory! *have NOT had to buy! I'm not a huge fan of shorts, but when it gets hot, you must! I second J. Crew's shorts...and also have had some good luck at Old Navy. 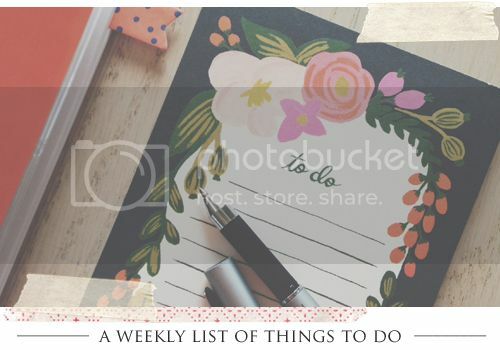 I love these kind of lists with little goals for the week :) writing something down is always good for your motivation! Happy Saturday!